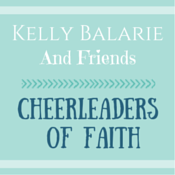 I sure could use a fresh infusion of faith and fearlessness in my life, so I’m turning my blog over to blogger and author friend Kelly Balarie to tell you what she’s learned writing her latest book. If a baby bird never moves out of the nest, she’ll never fly. If a toddler never takes that one inch forward, fearing falling, she’ll never walk. If a woman never takes a small step, she’ll continually stay, nowhere. A small step out of move-out faith is mission-critical. Why? Faith brings to life what we cannot see, but desperately hope for. Where do you stand on the faith-scale? 1-10? Do you see new life arising from your hopes, hunger, and hardships, or are you simply staying stuck, where you are? Nearly every time, in these situations, I thought: There’s no way out. This is impossible. I don’t know what to do. I am going under. I don’t have the (time, ability, resources or wisdom) to get through this. God won’t really be there for me; He’s got better things to do. I am stupid for letting this happen. No one understands. I’m all alone. If faith is hope in what we cannot see, I’ve lived hopelessness. If it’s “impossible to please God without faith,” no wonder I felt so displeased with myself. If God says, “everything is possible for those who believe”, I suppose I haven’t believed. The inclination here is to be angry at myself saying, You always mess up. You always fall short. You never do anything, right. But this is not how God speaks to me. This is not being Battle Ready. Knowing this prepares my mind to walk into fearlessness, boldness, and purpose. God’s grace welcomes in new faith. 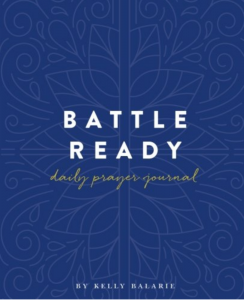 This is a vital, because faith is our greatest battle weapon. It takes us places, it tames our trials and it forges us ahead, like doubt never can. Envision Jesus one step ahead of you. If you know God is at the place you’re afraid of, how much more can you trust He’s preparing it for your arrival? Hear in your mind, continually: God really cares for me. The more we believe God sees us, the more we’ll believe He’ll see us through. Inhalethe reality, God is with you. Sure, there may be bumps in the boat. This doesn’t mean Jesus is sleeping. He’s fully aware of all your going through, the path He has you on, and your perfect escape with Him. Holda light schedule. If you clear way in your schedule, you’ll make room to experience God’s Word in such a way where it can begin to dwell in you. Pick up your shield of faith. When the enemy throws an arrow at you, like a random email that makes you feel sad, a rejection from a friend that leaves you disappointed, remember: God is with you, for you and He is on your side. He is working out something in you and for you, that’s even better than you expected. 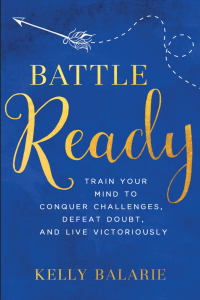 You can become battle ready and live victoriously. You can prepare in advance rather than emotionally responding and reacting to the hardships that you face. God will give you peace as you learn His wisdom and strategies. 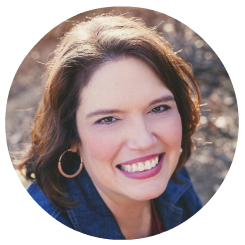 It’s great to have you back at Booknificent Thursday on Mommynificent.com after our month’s vacation! Thanks for sharing!